I didn’t know about refugees in Japan at all. 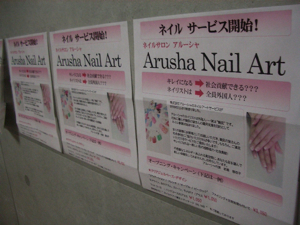 We’re introducing you to a nail salon called “Arusha“, which is managed by a Japanese young entrepreneur. There are some differences between Arusha and other nail salons. 1) All of the manicurists of Arusha are foreigners. 2) Most of them are refugees. But there’s no somber atmosphere at all in the salon. They welcome you with very friendly smiles. And while you get your nails done, manicurists and customers enjoy talking. I interviewed Kanako Iwase, a representative of Arusha. This interview is divided into two parts. In the first part, I hear why Iwase, who used to be a gung-ho career woman, opened a “refugee nail salon”. Then I tell you about her present state and future vision. Do you know any other nail salons which hire refugees as professional manicurists? No, I don’t. I don’t know whether this kind of nail salon is even in overseas. But in countries where there are many immigrants and which absorb refugees, there may be refugees among workers at nail salons. After Lehman’s fall in 2008, many foreign laborers were dismissed at every workplace. Refugees who had no choice but to work at restaurants or factories were no exception. In order to survive in such an extreme environment, they need to invest in themselves – that’s my personal policy. In that respect, they can acquire technical knowledge if they become manicurists. 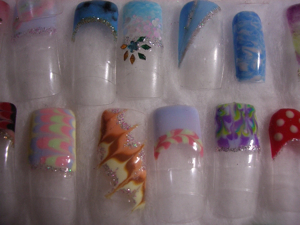 I think they’ll be able to live everywhere because the Japanese style of nail art is very popular worldwide. Did you start a nail art business in order to deal with the refugee issue? Yes. If you focus on issues in refugees’ lives, you need to think about their jobs and living cost (everyone has to think about these things, though). I’ve been a businessperson who worked for a commercial company, so I thought that I would give up easily if I do unprofitable business even tough I make a social contribution through it. Also I don’t want people to think like, “They are poor so I’ll buy their products for them” because even if they think this way, it is unlikely that they’ll be regular customers of our products. On the other hand, many women love nail art and we won’t carry an inventory because we don’t sell things. So I thought my idea could work. Did you have experience in nail art business? Not at all. I’ve worked at some companies for a decade. I worked as a salesperson and was involved in some company formations. Also I went to a British business school. Just before starting my own business, I worked at an executive-search company. But I’ve been interested in social action work for some time. When I was a student, I worked voluntarily for the relief of quake victims in the Great Hanshin-Awaji Earthquake. And I was involved in various volunteer activities. However I was not planning to establish an NPO or something like that at all. I’ve been wondering if NPO people get exhausted by their low salaries. That’s why you launched a refugee relief as a commercial business. But did you hope to provide assistance to refugees when you founded a company? No. I quit a company in January 2009 and started my business two months later. But I was working on different things. The name of my company “Arusha” is the name of a Tanzanian city. Sumiko Iwao, a Japanese university professor, was planning to start a microfinance business in Tanzania and I wanted to join her. I think the volunteer in me started to stir. I met Iwao at the end of 2008, when I was working at a company. I heard her plan and wanted to go to Tanzania, but I couldn’t take off during the end-of-the-year rush. I was thinking that it was time to leave the company I was at at that time and was interested in the fair trade. I heard about accessories and honey which are produced by disabled people in Tanzania from her. Then I wanted to import their products to Japan and sell them. But in order to do that, I had to set up a corporation to import and sell fair trade products. So I quit my job and established my own company. As I mentioned before, I’ve been involved in company formations. So I didn’t think it would be difficult to set up the company. What was your core business at that time? Helping venture companies, such as holding lectures or seminars, helping my friends’ companies and so on. But one day, I told my friend that I was interested in the fair trade. Then I made many connections with non-profit organizations. People who got to know that I was a friend of Iwao’s supported me. When a microfinance manager of ILO, International Labor Organization came to Japan, I made a presentation just because I was a friend of Iwao’s. Then I met a person who was involved in helping refugees. Hisako Ishitani, a representative of a refugee support organization called “REN” (Refugee Empowerment Network). A friend of mine who thought that microfinance and refugee issues were close introduced me to her. At that time, I didn’t know about the circumstances of refugees in Japan at all. I asked Ishitani, “Are there refugees in Japan?” but she told me a lot of things, including her fair trade business. She conducted the fair trade beaded accessory. I looked at accessories that were made by refugees in Japan. They were really wrought well, so I came up with an idea. “They are very good with their hands. They will be able to be good manicurists!” Nail art never needs to carry an inventory so it’ll make good business sense. You came up with a nail art business in the end. Originally, I’m a big fan of nail art. I enjoy not only going to nail salons but also manicuring by myself as a hobby. Also I’m sure that everyone’s nails grow. Expendables suit for business, especially nail art business is more profitable than other ones. I thought that disadvantaged people should be involved in a highly profitable business. Because they can make a profit even if you set a lower rate. I thought that it would be better for them to make inroads in Japanese society through that kind of business. I told Ishitani about my idea and she asked me to try it out. Then it spread to other refugee support organizations and the number of people who got interested in my idea increased. You could do this even though you didn’t know about the refugees’ circumstances in Japan until quite recently. Right. After I decided to carry on a full-scale operation of refugee assistance through nail art, I went to a nail art school and learned techniques. I was going to teach these things to refugees because I couldn’t afford to hire a nail art instructor. I thought it would be much cheaper and I could tune in to manicurists if I learned by myself. Above all, I love manicuring. I went to a school everyday for two months and mastered nail art. Then I started to offer training programs for refugees in February, 2010. My class was limited to eight people but over 20 refugees came to an orientation session which was held before training. To be continued to Part2 → Click!